Alex Wood had a revelation late last season, watching Washington Nationals star Stephen Strasburg. Strasburg had completely eliminated the windup from his delivery, and that clearly intrigued Wood. For many years in baseball, the common idea was that pitching from the windup allows a pitcher to generate more torque from the motion of winding up and ultimately throw at a higher velocity than from the stretch. However, there isn’t any actual data backing up this theory. If you think about it, the most important pitches of any game come from the stretch anyway. The advantage to the stretch is most notably the simplicity. With fewer moving parts, the delivery mechanics — in theory — are more repeatable and the consistency gained shows with improved command and/or health. Pitching is a very feel oriented thing, so ditching the windup is certainly not for everyone, but it is now for Wood. Of guys who’ve at some point ditched the windup completely to name a handful — Strasburg, Carlos Carrasco, Yu Darvish, Jason Hammel and Danny Duffy. All these guys are tall at 6’3+, with Darvish and Hammel being 6’5 and 6’6, respectively. 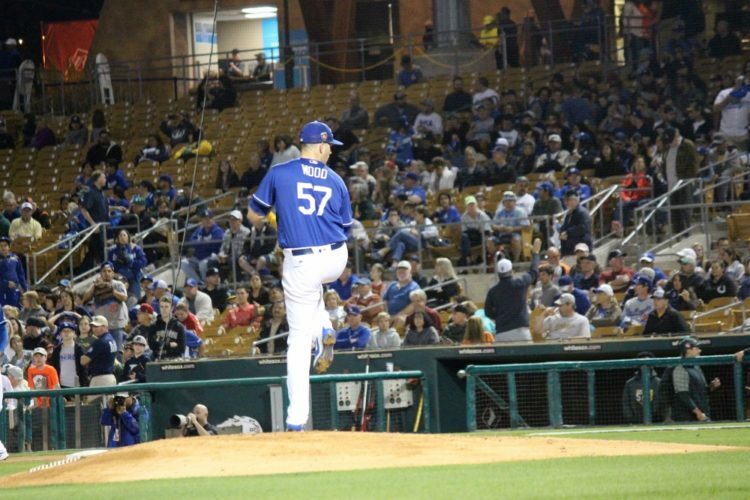 For pitchers, the added length and height results in a larger range of motion — but also with longer moving parts, there is more time for delivery mechanics to be thrown off. Wood is listed at 6’4, and while he wouldn’t be the tallest of this group, he probably does have the most non-traditional delivery. The delivery already looks difficult enough to repeat, and Travis Sawchik of FanGraphs noted in August that Wood’s vertical release point was deviating more than normal. I mean, does this look easy to repeat? “The fix that I saw was this…I’m a long, tall guy. It’s usually pretty hard to get everything on time for us bigger guys. So anything to simplify the delivery to make it easier.”. Also, Strasburg, Wood, and Darvish have all struggled with health in their careers, and Darvish and Strasburg seem to have benefited from eliminating the windup from their mechanics so far. In 2017, Wood had his best year as a professional, but it was definitely a tale of two halves. Overall, he went 16-3 in 152.1 innings, with a 2.72 ERA and a 1.06 WHIP. Of all starters with 150 IP, Wood ranked fifth in ERA, seventh in WHIP, and 11th in FIP and xFIP. Opponents hit a measly .216 against him, good for ninth overall. At the All-Star break, however, Wood was 10-0 with a 1.67 ERA in 80.2 innings. He lead the league in ERA, FIP (2.04), xFIP (2.58), was second in GB% (63.5%), and batting average against (.174), third in WHIP (0.89), and sixth in K% (30.9%). He earned his first All-Star game selection, and was well on his way to having a legitimate case at the Cy Young award. But with the second half came an extreme fall off. He dealt with a sternum issue later in the season and accrued just over 70 innings, posting a 3.89 ERA. Of starters with 70 innings pitched in second half, he ranked 40th in ERA, 64th in FIP (4.76), and 40th in xFIP (4.19). His GB% plummeted to 44.2%, which ranked 43rd (not ideal if you’re a ground ball pitcher), his batting average against ranked 54th at .259, his WHIP was 29th at 1.24. In addition to all this, his K% dropped dramatically to 18% ranking 63rd. The main association with his drop-off was his velocity. In his first few months, he was sitting 93-94 MPH with his sinker. He averaged 92.98 MPH in his starts leading up to the All-Star break. In his second half, his velocity continued to drop off, as did his effectiveness. He averaged 91.1 MPH on his sinker in the second half, and by October was barely averaging 90. Here, Wood’s velocity drop off is evident. The key is his sinker (black) velocity dropping off, but his off-speed pitches dropped off as well. 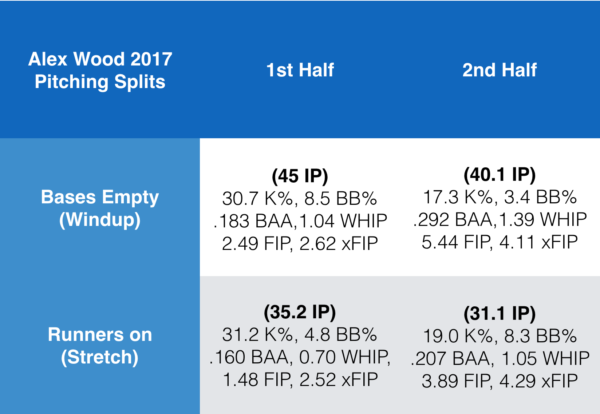 I felt listing Wood’s windup vs. stretch splits from 2017 as a whole would be flawed since he had such drastically different halves. Instead, I looked at his splits in the windup vs. the stretch in each half and compared them to each other. What we see here is that in Wood’s first half he was elite with the bases empty (windup), but his performance was even more incredible when pitching with runners on (the stretch). When looking at his second half, his diminished effectiveness is evident, but again he was a much better pitcher from the stretch. Over the entirety of his career, Wood has allowed a .616 OPS with a 1.04 WHIP, 3.13 FIP, 3.45 xFIP and .218 batting average against while pitching from the stretch. From the windup however, he’s allowed a .706 OPS with a 1.38 WHIP, 3.49 FIP, 3.43 xFIP, and a .262 batting average against. The numbers back up his decision to get rid of his windup and pitch exclusively from the stretch. What does it mean for 2018? Pitching from the stretch this spring, Wood saw improved results. He posted an ERA of 3.63 and a WHIP of 1.21. 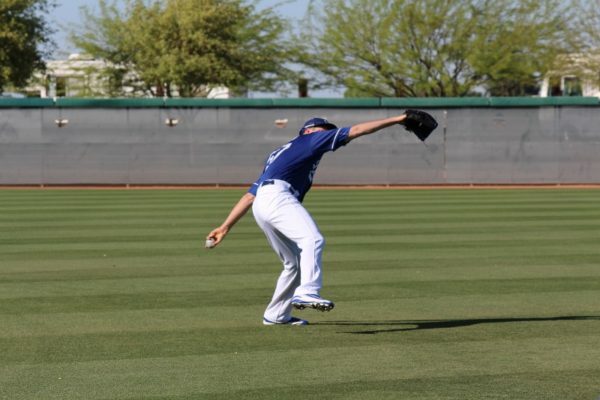 While not incredible, do keep in mind pitchers typically use Spring Training to work on specific things. Heck, Zack Greinke once got shelled just to prove a point. I think the most important takeaway from Wood’s spring was his strikeout rate. In 17.1 innings, Wood struck out 22 and walked six. The command probably wasn’t exactly where he’d hope for it to be in terms of the walks, but his 11.42 K/9 innings is back up near his elite first half of 2017. The reason his K/9 dipped last year was mainly the significant drop in velocity in the second half. So, based on his spring success, I’m guessing his fastball/sinker velocity is back up close to where it was at the beginning of 2017. Wood will open the 2018 campaign as the Dodgers’ No. 2, following Clayton Kershaw, which Wood calls a “great honor“. Ditching the windup has helped a handful of pitchers with health, command, and/or consistency. 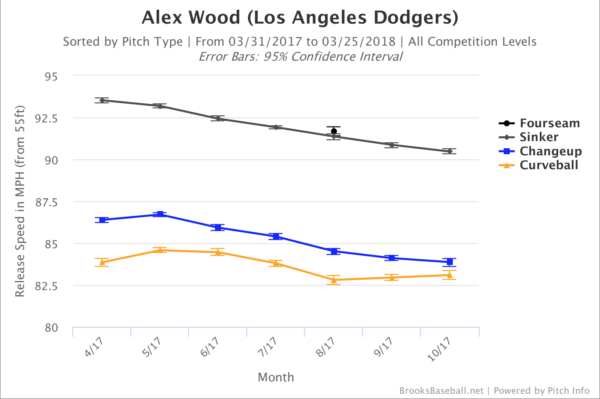 It remains to be seen what it’ll mean for Wood and the Dodgers in 2018, but the results so far are promising, and the numbers from 2017 back up his idea to change. If it helps him more closely resemble the pitcher we saw in the first half of last season, he’ll have a huge bounce back from his second half. Just a guy living in Thousand Oaks, CA who happens to love the Dodgers and statistics. 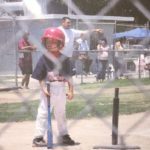 Hated baseball practice as a kid, but writing about adults doing baseball is alright.